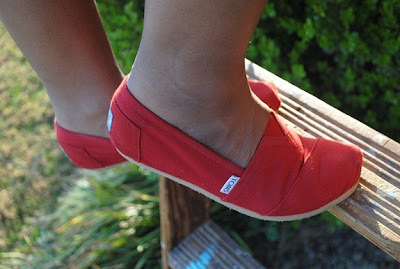 Several of my favorite bloggers have recently been talking about their love of Toms shoes. Marianne of Haven and Home recently talked about her first Toms purchase. Aren't they cute??!! I LOVE wedges. Black may be boring to some, but I wear lots of it, so these would be perfect for those summer days when I am out shopping and running errands! If I fall in love with them (which I am sure I will), then I will probably purchase Marianne's wedges for some extra versatility. I can't wait for them to arrive and am so glad that I was able to help a child in need! Love wearing wedges! The black ones you chose look like they'd be the perfect go-to shoe to pack in your suitcase. They'd go with everything. Thanks for sharing. Wedges were the "in-thing" in the '70s! They're back! Cute! I've only seen one person wearing Toms! Let us know how you like them! you did great and picked a great pair girl. I cant wait to see them in a photo on...GET IT GIRL!!!! And you helped a child, thats the best part. Hi Tiffany! I love the black wedges and seriously considered getting them! Thanks for including me in this post, that is so sweet!!!! I love wedges and don't own any TOMS yet....so now that they've created this new style, I'll definitely be joining the craze...and the cause!